Obama was elected president of the U.S. in 2008 and is gearing up to run for a second term. Born in Honolulu, Hawaii, Obama grew up in Indonesia before moving back to Hawaii to live with his grandparents. Obama moved to Chicago in 1985 after spending a year in New York, where he graduated from Columbia University, although he left Chicago in 1988 to attend Harvard Law School. Finally, Obama moved back to Chicago after graduating from Harvard Law School and became a civil rights lawyer in the law firm Davis, Miner, Barnhill & Galland. Obama also taught classes in constitutional law at the University of Chicago Law School. In 1994, Obama was elected to the Senate for the 13th district of Illinois and won reelection in 1998 with a large percentage of the vote. Although Obama ran for the House of Representatives in 2000, he lost to the incumbent Bobby Rush, pushing him to remain a Senator in 2002, which he kept without opposition. In 2004, Obama was elected to the Illinois Senate and was chairman of the Illinois Senate's Public Health and Welfare Committee. Obama continues to fight for his national health insurance plan, as well as trying to decrease the unemployment rate and stimulate the economy by increasing government spending. Obama's father, Barack Obama, Sr., was from Kenya and was the senior economist within the Kenyan Ministry of Finance and Economic Planning. Although Obama was born in Hawaii, he moved with his mother to Indonesia when he was six years old to join his step-father Lolo Soetoro, spending the early years of his life in Jakarta. Interestingly, Soetoro graduated from the University of Hawaii (where he met Obama's mother) with a degree in geography, but was a colonel in the Indonesian Army and then became an executive with Mobil Oil Co. in Jakarta. Obama's mother, however, feared him growing up in a foreign country, and when Obama was ten years old, sent him back to Hawaii to live with his grandparents. When Obama was attending Punahou School in Honolulu, two of his fellow students included actress Kelly Preston and Steve Case, the future founder of AOL. Obama's family history also includes the Kenyan branch of his family, who originated from the Nyanza Province and members of the Kenyan Luos. Obama Sr. met Ann Dunham, Obama's mother, at the University of Hawaii in a Russian language class, although Obama Sr. failed to disclose that he had a wife and family back in Kenya when he married Dunham, and the marriage failed quickly after Obama was born. Obama Sr. subsequently returned to Kenya. Obama's Kenyan grandfather was a soldier and a farmer. Obama Sr. visited his son once while he was living with his grandparents in Hawaii and took him to a jazz concert. This would be their only in person meeting. Obama's American family history includes his grandparents, Stanley Armour Dunham, who was in the army and a member of the USAF 1830th Ordnance before becoming the manager of a furniture store. Obama's grandmother, Madelyn Lee Payne Dunham, worked on an assembly line. The Dunham family can trace their roots back to Christian Gutknecht Goodnight who came from Bischwiller, France in the mid-1700s with his wife Maria Magdalena Gruholtz. Dunham ancestors are of multiple descents that include Scottish, Irish, English, as well as French, German, Swiss and Welsh roots on the maternal side of the family tree. Robert Perry is an example of an early Welsh relative, and Falmouth Kearney is an Irish ancestor who sailed from Moneygall, Ireland, to New York in 1850. On the paternal side of the Dunham family, lineage can be traced to Jonathan Singletary Dunham, who was born in 1639 with English and Scottish roots. Jonathan Dunham's heritage can even be traced to England's Edward I born in 1239, whose nickname was Hammer of the Scots and was the son of Henry III, as well as to the Scottish king William the Lion, born 1143 and holding the throne from the early age of 22 for 50 years. Obama met his wife Michelle, who had also graduated from Harvard Law School, while they were both working at the law firm Sidley and Austin in Chicago. 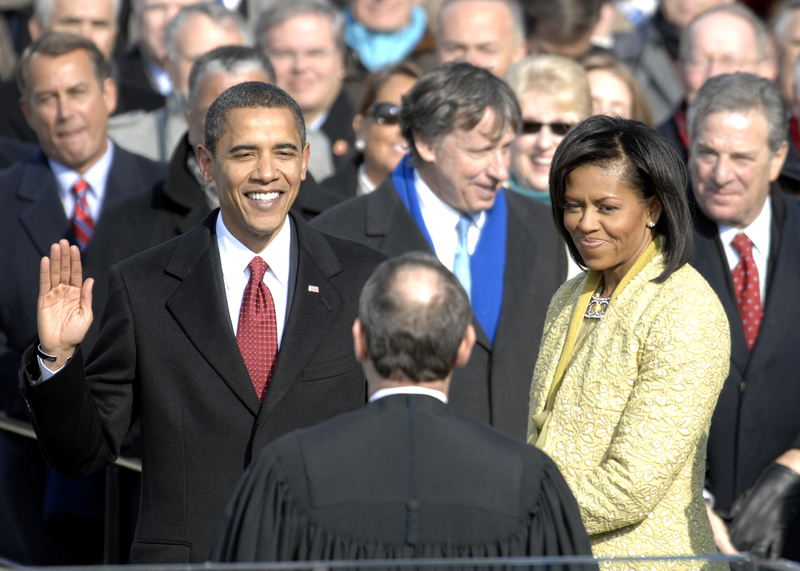 Michelle was a trial attorney at the time for antitrust cases. At the time, Michelle Robinson was told to mentor Obama in the firm, but romance bloomed instead. They married four years later in 1992 and have two daughters: Malia and Natasha. During their courtship, Michelle left Sidley and Austin when she was offered the Assistant Commissioner of Planning and Development position. She also spent six years at the University of Chicago as the Associate Dean of Student Services before accepting a position at the University of Chicago Hospitals for Vice President of Community and External Affairs, which she left behind for the White House and her position as First Lady.